Happy 50th Birthday to Late Late Show host and Doctor Who fan Craig Ferguson! 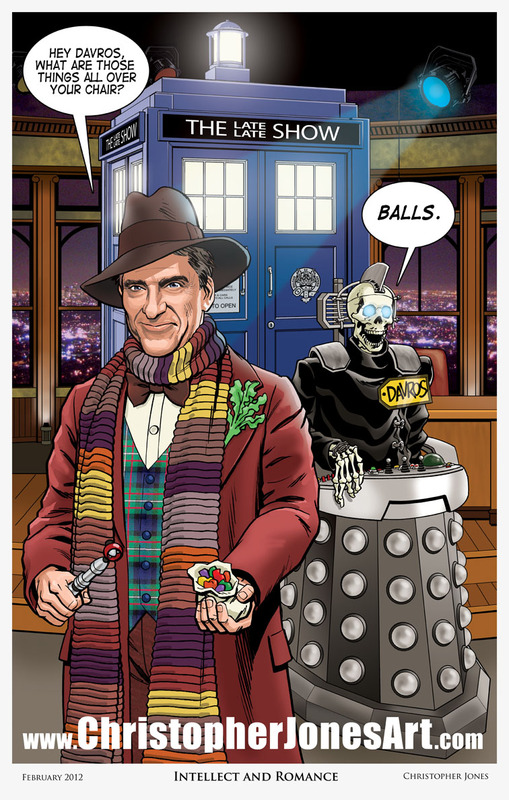 Doctor Who | Christopher Jones | May 17, 2012 1:40 pm | Comments Off on Happy birthday Craig Ferguson! This weekend I’ll be attending the Gallifrey One convention in Los Angeles, California, where much Doctor Who geekery will be had. I’m not there as an official Guest and I won’t have a table, but if you’re there and spot me please say hello! My newest print is below, and I’ll be making it available at the Gallifrey One Art Show. I’ll soon be relaunching my Etsy store, where you’ll be able to find all my prints, as well as original art from my comic book work. This makes a lot more sense if you’re a regular viewer of The Late Late Show with Craig Ferguson. The Web Site URL does not appear on the actual print.